42 published items with the word (s) or phrase Ispo in News, Trends, Videos, Photo galleries, Agenda and sorted by "date descending". The trade fair will bring together over 2,800 exhibitors and an international audience to discuss the latest trends in the world of sports. There will be a special focus on sports like climbing, yoga and e-sports. As the world’s leading travel trade show ITB draws to an end, FashionNetwork.com talks with Jack Wolfskin CEO Melody Harris-Jensbach about how travel trends and outdoor brands are changing fashion. The outdoor and sports exhibition based in Munich announced the creation of Polygon, a fair section dedicated to board sports, with a launch planned for the next Ispo edition February 5-8. Amer Sports quarterly sales have recorded an 11% rise, reaching more than €635 million. In the outdoor division, textile and footwear sales jumped respectively by 19% and 16%. In 2017, OutDoor will finally debut on a Sunday. The trade fair will take place one month earlier than usual, from June 18 to the 21. From January 24 to the 27, Ispo Munich will welcome a record-breaking 2,645 exhibitors. 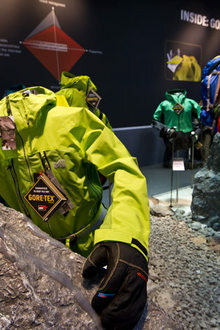 The exhibition, dedicated to sporting goods and clothes, continues to benefit from a rising market. Ispo, which was held in Munich from February 5-8, welcomed 80,000 visitors, with stable attendance compared to the 2014 edition, but still high for the European sporting goods and apparel trade show. This fall, Black Crows is launching its first apparel collection. The French brand has enlisted the likes of Camille Kunz, a Swiss designer and winner of the Hyères Festival Chloe fashion award in 2013, for the project. Ce vendredi 14 septembre, les acteurs du sport sont invités à une journée sur le thème "Réussir ensemble la transformation digitale". La rencontre est organisée par l'Ispo Academy dans les locaux parisiens de l'EM Lyon. ...clôture du salon Outdoor de Friedrichschafen, l'équipe de l'Ispo présentait à Munich les grands axes du futur Outdoor by Ispo, qui se tiendra du 30 juin au 3 juillet 2019 dans la cité bavaroise. ...Una semana después de la clausura del salón Outdoor de Friedrichschafen, el equipo de Ispo presentó en Múnich los ejes principales del próximo Outdoor by Ispo, que se celebrará del 30 de junio al 3 de julio de 2019. ...Una settimana dopo la chiusura del salone Outdoor di Friedrichschafen, il team di Ispo ha presentato a Monaco le novità della prossima edizione, che si svolgerà dal 30 giugno al 3 luglio nella città bavarese. ...sportivo, che ha chiuso il 2017 a 50 mln di euro (+15%), torna a un vecchio amore, lo sci, e presenta la linea AI18-19 a Ispo 2018, presso lo stand di Primaloft, che fornisce le imbottiture. Ispo dedica un nuovo spazio agli "action sport"
...Per la sua prossima edizione, dal 5 all’8 febbraio, Ispo si regala una nuova sezione dedicata agli sport con tavola, “Polygon”, riservata al 100% alle attività B2B. ...Das Berliner Label Arys wurde im Rahmen der Ispo Awards für seine funktionalen und trendigen Entwürfe ausgezeichnet. ...Die Ispo Munich will mit rund 2.800 Ausstellern alles rund um die neuesten Sportswear- und Equipment-Trends vorstellen. Der Fokus liegt demnach auf Action-Sport wie Klettern, aber auch Fitness und Yoga sowie E-Sports. ...Cordura, eine Marke des Schweizer Unternehmens Invista, wurde bereits zum 5. Mal in Folge mit dem Ispo Textrends Award ausgezeichnet. ...The recently held ISPO Shanghai 2016 trade show, which hosted 470 exhibiting companies, witnessed a 32 per cent year on year jump in the number of exhibitors. ...ISPO recently launched the ISPO Textrends, a trend application which provides an overview of top textile innovations for 2017-18 and information to designers and product developers in performance textiles. На Ispo откроется пространство, посвященное видам спорта "с досками"
...Na cobertura da ISPO, feira esportiva alemã, com lançamentos de inverno 2012, o headwear foi mostrado como uma tendência, chamando atenção para sua versatilidade. Spor ve outdoor markalarının ticari fuarı ISPO’nun 2017 yılı buluşması B5 Salonunun Yeni alanında sekiz spor girişimini tanıtarak, büyük bir görünürlük kazanmalarını sağlayacak. La organización del salón deportivo de Múnich, programado del 5 al 8 de febrero, seleccionó a 8 nuevas empresas que serán resaltadas en la edición 2017. ...El Ispo contabilizó más de 80.000 visitantes. Una afluencia estable para una edición con dos tercios de los visitantes provenientes del extranjero. ...O primeiro produto do ano da ISPO Munique foi ganho pela Berg Outdoor no segmento Urban com as botas Sordo, feitas com materiais sustentáveis: couro de carvalho, burel e uma sola Apinat. ...onde estarão cerca de 2.800 expositores, 41 dos quais lusos. De 3 a 6 de fevereiro, pela primeira vez, a área total da Ispo Munich irá atingir os 200 mil m2. ...A week after the end of the OutDoor show in Friedrichshafen, Germany, the organisers of ISPO have launched the new OutDoor by ISPO event, scheduled from June 30 to July 3 2019 in Munich. ...Alibaba Group and the leading sports-focused network for professionals and consumer experts, ISPO, have decided to collaborate. ...organiser of sports and fashion tradeshows, has announced the launch of three mega trends of the textile industry for ISPO Textrends Spring/Summer 2019, which includes Moment, Dynamic, and Calm. ...ISPO Munich 2018, a leading global trade fair and an important platform in the sports business, is set to present its latest innovations in the sports industry at the expo from January 28 to 21, 2018, in Germany. ...More than 2,800 visitors attended the ISPO Textrends and the daily conferences, held from February 5 to 8, 2017, as the selected products were revealed in a newly designed forum. ...ISPO Beijing, the leading multi-segment B2B sports exhibition in Asia, held from February 15 to 18, 2017, at the China national convention centre, in Beijing, China, has kicked off with a record number of exhibitors.